It’s gotton beyond that somehow. I’ve been asked by a couple different people, “Do you ever have a bad day or feel down?” throughout the last few weeks. And the easiest, and most honest answer is absolutely. My husband and I are having a 60 year old home renovated and it’s waaaaay behind schedule. We’re supposed to be moving into this new home two days after Christmas and I haven’t packed single box yet. The condo we’re living currently has been on the market for seven months and we’ve yet to have a single offer (even after lots of interest and dropping the price again and again and again). My Mom was having a bit of a health scare that required more tests (don’t worry…all is well now…it was nothing). And then there’s the holidays: Because of our living situation, we haven’t even been able to put up a tree or decorations. We were going to host our annual Pope Family Christmas party, but now no one’s coming to it. Oh, and the freezing temperatures and gray skies are back in full force here in Columbus. It’s become a regular occurrence for me to lie awake for hours in the middle of the night with all this running through my mind. So, yea…life happens to life coaches too. This past Monday was one of those days where the overwhelm of it all was having its way with me. I hadn’t slept well, yet again. I was equal parts both pissed-off and worried about the sale of one home and the construction of another. I even got a little self-righteous about how the contractor still get to keep his 30% margins and our money while we keep our two mortgages and the stress and inconvenience. I was irritated and sad that at one time our family was all coming over for the holidays and now no one is, so we’ll likely not get to see them this holiday. Because I have plenty of coaching tools at my disposal, I was using all of them, but I hadn’t yet felt the relief I wanted. And the only answer that came to mind was, “I want to take to my bed.” Going to bed was the only thing I could think of that would feel good to me in that moment. Is it odd that a few minutes later all the electricity in my office suddenly went out, leaving me in a pitch black room (with no heat)? So, I closed my laptop, packed up my bag, put on my coat and was headed home with the intention of taking a much-needed nap. I got a second wind on the drive home and called my husband to see if he wanted to blow-off his afternoon and go to a movie with me. We spent the afternoon and evening Christmas shopping, eating dinner and going to see a great movie. I got a good night’s rest and everything felt much lighter the next day. I wasn’t worried anymore; I wasn’t trying to control the uncontrollable. My personal pity-party was over because I remembered that this is the life that I created. And if I had created this, and if I didn’t like it, it was up to me to create something different. I was back to feeling happy and hopeful, able to appreciate all the good that surrounded me again. Even when nothing in the circumstances around me changed. It’s okay that life sometimes hits me between the eyes; it keeps me grounded so that I know what my clients feel. It’s okay that sometimes I need to distract myself from my life or take to my bed to slow the momentum of my thoughts when necessary. It’s okay to experience stuff that doesn’t feel good so that I can use the tools I teach to walk myself back to the light. It’s okay because, like the ocean, I have ebb and flow too. 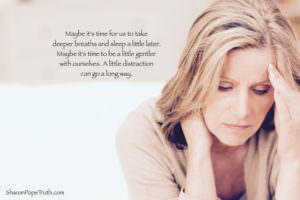 Maybe it’s time for us to take deeper breaths and sleep a little later. Maybe it’s time to be a little gentler with ourselves. Maybe we could use some distraction right now…a little bit goes a long way.